Today we have a special guest post from Dr. Jim Brown, an Associate Professor of Science and the former Dean of Science, Engineering, Health Sciences and Human Performance at Ocean County College (OCC). OCC was one of the first community colleges in the United States to develop Anatomy and Physiology (A&P), biology, chemistry, microbiology and other science courses totally online. The content and laboratory were directed via distance learning. In 2003, OCC was awarded a $458,000 grant from the Robert Wood Johnson Foundation to develop a One Day per Week Nursing Program which allowed students to attend clinical training one day per week while the didactic portion was delivered online. This opened up nursing to a whole new group of students who were limited by time, family commitments, work or distance. Almost immediately we recognized that the success of the One Day per Week Nursing Program would be limited if we required students to come to campus to take their prerequisite science courses. We needed to put science totally online. I credit OCC’s president Dr. Jon Larson for having the vision to place OCC’s science courses totally online. Dr. Larson had returned from a conference where he saw a Colorado-based company, now called Hands-On Labs, demonstrate LabPaqs- lab kits that students could purchase and use right in their own homes. This was the missing piece we needed to solve our problem! LabPaqs provided rigorous scientific experiments, addressed safety issues, allowed students to work individually which provides a greater depth of learning, were easy to use, and came with a lab manual at no extra cost. The bottom line was that although we had the expertise to develop online courses the laboratory portion was a challenge. Adding LabPaqs provided everything we needed to offer laboratory based laboratory courses completely online. 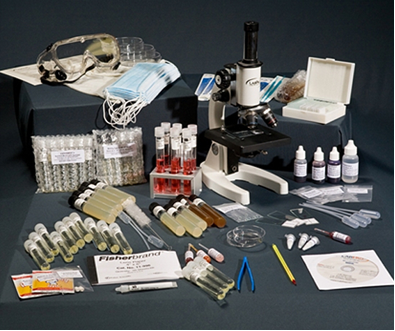 The decision to use the home based laboratory kit instead of a virtual laboratory experience was also based on concerns expressed by many four year colleges and universities. Transferring an Anatomy and Physiology course is much easier if it includes a hands-on laboratory experience. The home based kit allows students to hone their critical thinking skills via the trial and error that is manifest in laboratory practice. Hands-On Labs, Inc. had been producing LabPaqs for variety scientific disciplines and supplying them to a number of online science programs in higher education. We could now bring a total of 14 online science courses with a laboratory offered completely online and offer a complete Associates of Science degree in general studies with a concentration in science totally online. At the time we started we were using WebCT which gradually became BlackBoard. The content was largely MS Word files and our delivery was largely huge outlines which were “all text.” Students feedback indicated that the content was boring and lacked interaction. Dr. Brown said that SoftChalk was the key to making content interactive and fun. We discovered SoftChalk was an easy way to place content online in an interactive format. I insert an interactive learning game at the bottom of each page to reinforce learning. Our students are from the MTV Generation, and they do expect interaction in the online environment. The drag and drop exercise that provides a favorable sound when students drop the object into the right box, providing immediate feedback. 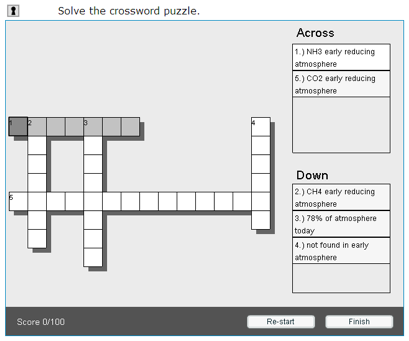 Crosswords are also a popular tool, allowing students to hone many different skills. Solving the puzzle requires the use of new vocabulary and terminology in the process. Even a simple misspelling matters, and students also learn to make inferences, evaluate choices, and arrive at conclusions. Media, especially video, is the perfect medium for students who are auditory or visual learners. Dr. Brown said that he found that placing small video clips strategically throughout the online course enriches the learning experience for the students. It is so easy to insert a video in SoftChalk. I can shoot a short ‘talking head’ video, post it to YouTube and embed it almost immediately into SoftChalk. Publishers are providing excellent videos with their text books and they can be easily imported into online courses. Both the use of SoftChalk and Hands-On Labs LabPaqs were the key to our success in becoming an East coast powerhouse in providing science totally online. As a result, we have attracted students from throughout the country, as well as deployed military students serving overseas. 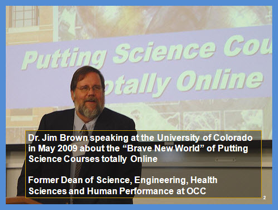 To learn more about the online science courses at Ocean County College, view the recording of Dr. Jim Brown’s Innovators in Online Learning Session.